Well the first post of the new year so a belated “HAPPY NEW YEAR TO YOU ALL” We only started back yesterday after a couple of weeks off and with all the bad weather and not being able to get out, Having the kids off for two weeks felt like two months! lol Come on you all felt the same! Wanted to get off to a good start as soon possible and just realised the last blog was on the 7th December, Wow seriously where does time go? Hope you all had a lovely Christmas, Actually I’m glad to be back at work as we stopped at the wrong time when things were just flowing nicely and now after the break its a bit of a struggle to get the throttles on full again but due to the backlog of orders from last year we have no choice which is good as it gives me that little push we all need going into a new year to which I’m really looking forward to. We should get our new packaging next week which looks fab well it does on the computer (fingers crossed) so another job marked off last years list! This years list is all about making things – WOOHOO and then we obviously have to try and sell them! Yet this list already looks longer than last years and its only the second day back. Ok I wanted to blog about these Angel wing & Pearl earrings that we made last year and done us proud over the Christmas period, A simple design but look fantastic due to the AAA white/creamy round pearls we use which make them look so elegant, Thinking about making a personalised version but need to see if it looks right and also that its right for IndiviJewels, Sometimes you can over do personalised jewellery to the point of it looking tacky and cheap. Anyway back to these earrings which I just love, Well I would say that as it was me who designed and made them! Like I said a simple piece but one that has a standout look without being bulky and have that “I want to be noticed desperately” tag on them. 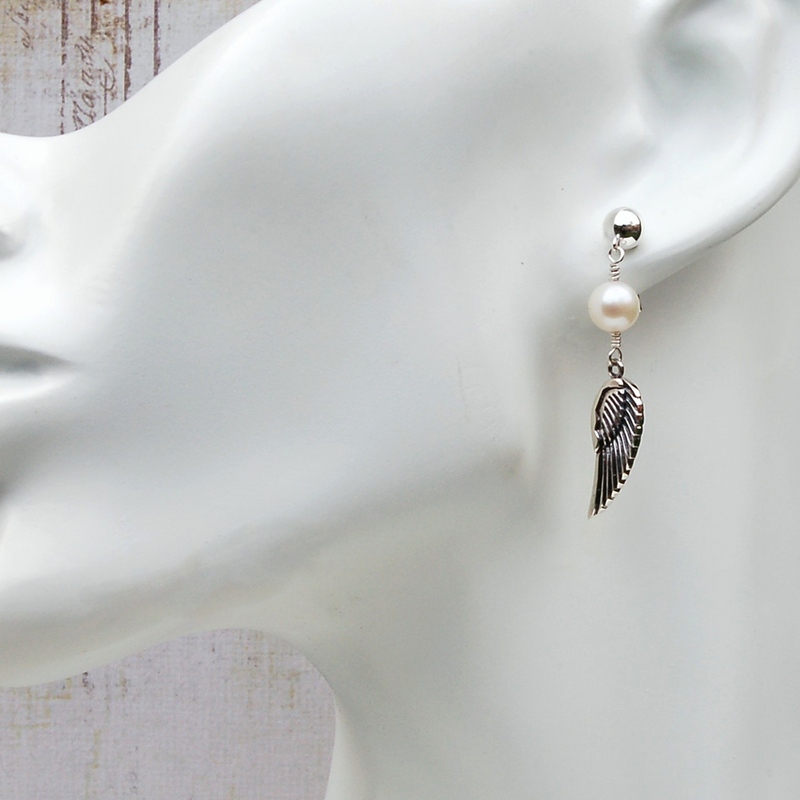 The Angel wing is Sterling silver and the Pearls we use are 8mm, Great size and great looking pearls with a lovely creamy colour to them and the ear stud is a ball design which is 5mm. We could have put a bigger ball stud on but we wanted the main features to stand out which I think we managed to acheive. The good point I like about these earrings is although your first thought is “Wedding” these earrings can be used for everyday wear which is what we try to do at IndiviJewels unless we actually make a piece for a specific occasion. OK so good start to the new year blogging, I just have to keep it going hopfully at least once a week. Right back to work!